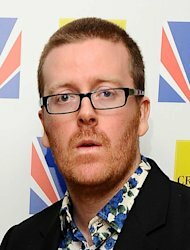 Comic Frankie Boyle has defended his controversial comments about the Paralympics as "celebratory" and said he was just doing his "job". He was criticised after joking that the Saudi Arabian team at the Games were "mainly thieves", referring to criminals being punished by having their hands removed for stealing. In another message posted on Twitter during the opening ceremony, he said: "I'm going down to the blind football to shout that the referee's a deaf b******." He told fans: "I'd say my Paralympic tweets are celebratory. I'll be joking about Paralympics same way I joked about the Olympics. That's my job yo." He also said people should read the jokes and make their own mind up, adding they were "Celebratory, non discriminatory, pretty funny". In 2009 Boyle was censured by the BBC Trust for comments about Olympic swimmer Rebecca Adlington, following her gold-winning success at Beijing the previous year. His remarks, made during an edition of the Mock The Week TV programme, were ruled to be offensive but no further action was taken, which prompted her agent to complain about the "slap on the wrist" when Adlington had been humiliated. Channel 4, which previously broadcast several of Boyle's shows including Tramadol Nights and The Boyle Variety Performance, distanced itself from the comic. A spokesman for the Paralympics broadcaster said: "Frankie Boyle was tweeting from his personal account and not on behalf of Channel 4. He is not under contract and there are no shows planned with him." Really, what punishment could - and indeed should - have been meted out to him regarding Adlington's appearance? It offended her? So what? Totally Agree. Frankie Boyle man is a professional controversial comedian. His jokes were actually quite tame for him. Some of his stuffs a bit sick for me- but these jokes are just that, jokes! I was in hospital with a few amputees and their sense of humour is what keeps most of them going. One wonderful lady had a husband who was a comedian and looked and sounded like Frank Carson- we were all in stitches when he said he was selling a bag of left shoes on ebay!! And a left leg amputee out having a smoke with a right leg amputee says- ere, tony what size shoe are ya? We could go halves on a pair!! Id never met any amputees til then, and their ability to laugh at themselves got them thru. People are offended by the silliest things these days! People are offended by proxy. Then they fins a bandwagon to jump onto. Sometimes the best comedy is when it is close to the bone.